Running the Xor2 Neural-network in sAPL on an iPad-1. The function "Actnet" takes "Example", and uses Wtab1 (a matrix), and Wtab2 (a column vector) and Btab (biases) to activate a simple neural-network, trained using Xerion. The "Example" matrix is a simple boolean exclusive-or, as shown in the 4x4 matrix at screen bottom. I have hacked and "jailbroken" my iPad Gen-1, and have loaded sAPL on it. This was the APL product I originally released on the Blackberry Playbook, and remains available for Android devices, from the Google PlayStore. (A Windows Cmd-shell and/or DOSbox version of sAPL is available from the Gemesys Github account, as a .zip file.) sAPL is a P/C version of the original IP Sharp APL mainframe product, which ran on IBM 370's, and Amdahl V8's. This iPad version, running under DOSpad, provides a workspace just over 300K. It is a small, but reliable, implementation of a full APL. 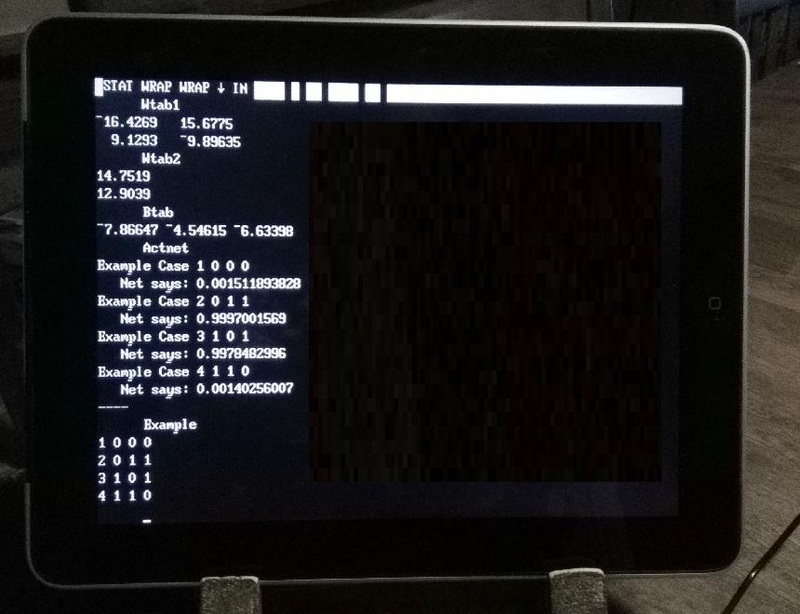 The hack involved jailbreaking the iPad with Redsn0w, which then installs the excellent Cydia environment, which allows installation of all the Linux/Unix utilities, including OpenSSH, related network utilities, and various Linux/Unix utilities such as PSTree, Screen, VIm, etc. From the above site, navigate to page bottom, and download the file: "redsn0w 0.9.15b3" for Windows, and note that it needs to be run in Administrator mode. The steps for the jailbreak are detailed, and require the iPad to be connected to a Windows P/C. You downlaod the RedSn0w tool and install it on your Windows P/C/. Then, connect your iPad to the P/C, and put the iPad into DFU mode. This is done by holding the home and power buttons on the iPad for 10 seconds, then release the power button, but keep holding the home button, for another 10 seconds. Then release the power button, and the screen should stay black. This is the mode where iTunes can update your device. Once you have SSH access to the iPad, the APL executables can be installed as directories in the /var/mobile/Documents folder, where they will show up as available in the C: drive, when DOSpad is started. You do not need to modify the dospad.cfg file to mount C:, as DOSpad already mounts /var/mobile/Documents as C:. Confirm you have SSH installed on your Windows box by checking the version number, which will be shown if you use the "-V" option. Eg: from your Windows box, in a Cmd window, where you see: "C:\> " enter "ssh -V", and confirm you get: "OpenSSH_7.2p2g, OpenSSL 1.0.2g 1 Mar 2016" in response. Try a login to root, from Windows. Note: you have make sure you have assigned an IP# (or your router has given one with DHCP), to the iPad. Check the settings on the iPad to see what it's IP number is, then use that to log into it. The root password on a jailbroken iPad is "apline". Once you are logged in, try an "ls -l" command to list your files. I run a static IP#'s in my lab. Each machine is assigned a non-changing IPV4 number. Typically, your router will assign your iPad a temporary IP#. On your iPad, click Settings, then WiFi, then click the arrow to the far right of your local network name, and you should get a screen that displays your local IP number. Use that number above to access your iPad. Files can be migrated to and from the iPad using "scp", the secure copy program. The Redsn0w jailbreak results in two available login id's, "root" and "mobile". Both have original Apple passwords of "alpine". Download the terminal emulator from Cydia, start it, run "su" and login as root, and use "passwd" to change the default passwords for root and mobile userids as your first task. You do not need the source code to do this, but it is available if one is curious. alpine [ENTER] <or whatever the root password now is, since you should have changed it! 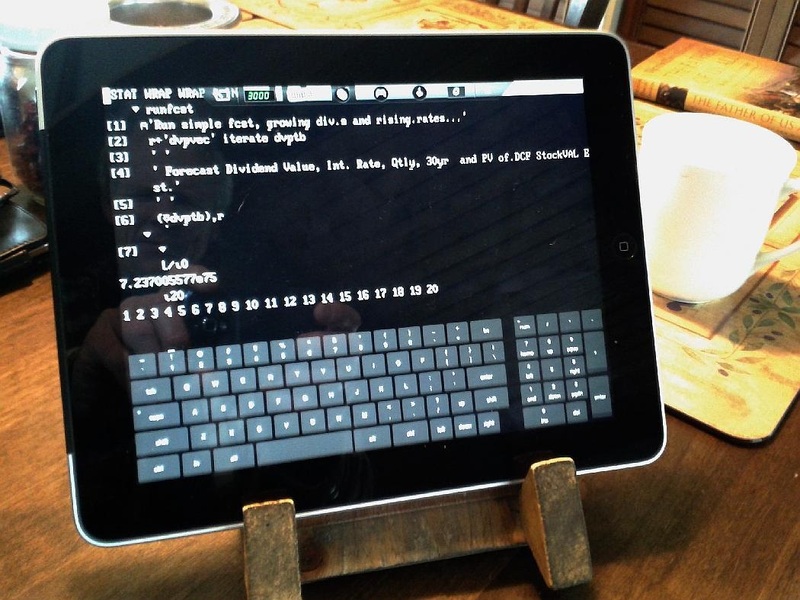 Here is a tutorial about installation of ".DEB" files on a jailbroken iPad. The final step is to use "scp" to copy over your sAPL directory, with sub-directories, from your Windows box. Before you do that, it is a good idea to create the sAPL directory on the iPad. Do that using the Terminal application, which you can you can get from the Cydia application. Cydia is used to download open-source software for the jailbroken iPad. On the iPad, click on the Cydia icon, and search for and download the "Terminal" utility. It lets you start a terminal session on the iPad, and create a directory for sAPL in /var/mobile/Documents. Just: 1) Start terminal 2) cd /var/mobile/Documents 3) mkdir SAPL. Check the empty directory is there, and in the right location, with "ls -l". From any directory, you can enter "pwd", which is a unix utility to "print working directory", which shows you what directory you are in. If you "ls -l /var/mobile/Documents", you should see a blue coloured filename called SAPL. (We will be using DOSpad, which is case-insensitive). 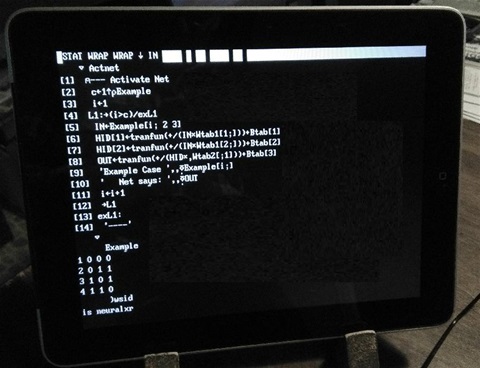 Now, you can run an "scp" from your Windows box, to the iPad. If you have an sAPL directory on your Windows P/C, you can migrate the entire directory, with subdirs, from the Windows box to the iPad, with a single "scp" command. The above command copies the sAPL directory from Windows directory C:\aplstuff\sAPL to the /var/mobile/Documents/SAPL directory on the iPad. To run sAPL on the iPad, click the DOSpad icon, and when the "C:\>" appears, simply enter "CD SAPL", which takes you the SAPL directory. From there, just enter APL (which starts a small batch file, to set up the font, etc.). You can exit sAPL and return to DOSpad "C:\>" prompt with ")off". The APL characters, in sAPL can be accessed using an ALT-key sequence from the displayed DOSpad keyboard. If you use the sAPL on the iPad in landscape mode, you can have full access to the DOS-based screen. (Try turning it to portrait-mode, and see what you get then... Some artist worked pretty hard to create an image - complete with a yellow sticky Post-it note - of an old 80386 based P/C!). "Where can I get sAPL?" Of course, a critical question. I have a "sAPL.zip" file which is the full sAPL package, including fonts. The total available workspace size is 312,722 bytes, a very tiny workspace, (you get the size using WA (quad-WA) function, in a clear workspace), but sAPL is fully free and when I purchased my copy, direct from IP Sharp's head office in Toronto many years ago, it came with a licence that not only allowed me to make copies and share it, but in fact explicitly encouraged this. 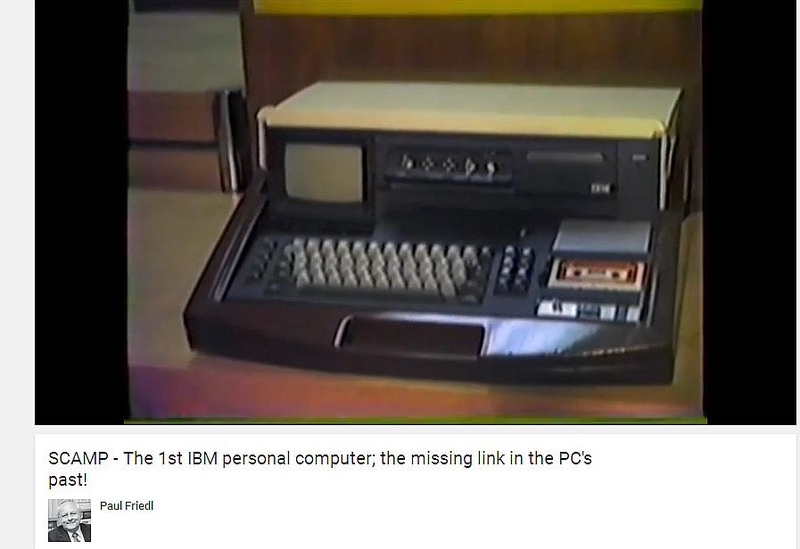 This is an image I found, from Paul Friedl, of the first real personal computer - the IBM SCAMP (Special Computer, APL Machine Portable), circa 1973. I bought my generation-1 Apple iPad in 2010, fully intending to put a working APL on it, one way or the other. Thank-you "redsn0w", for your jailbreak, and to Chaoji Li in China, who did the first DOSbox port to iPad. And thank-you "Saurik", aka Jay Freeman, for his Cydia project, and to everyone who contributed to making the iPad actually work as a proper computer, instead of the child's toy Apple seems to have wanted it to be. Fine work, guys. - Mark Langdon, GEMESYS Ltd.